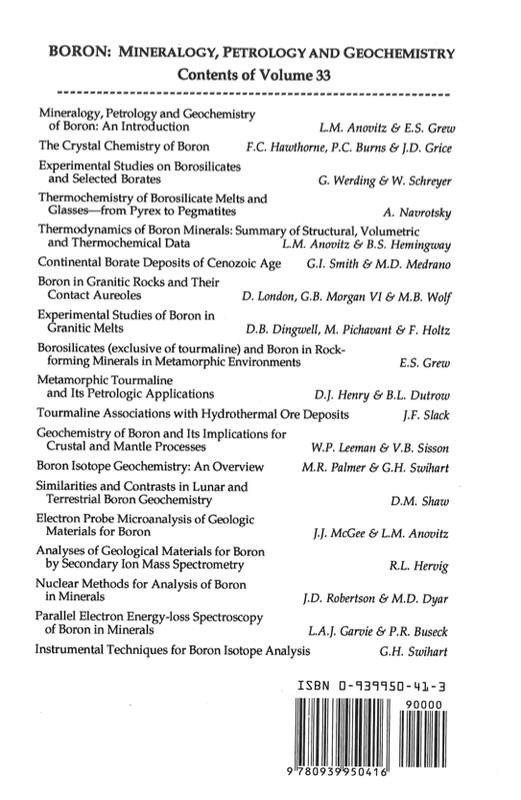 At the time of the first printing (1996), interest in the element boron was growing rapidly. We felt that it was an opportune moment to ask investigators active in research on boron to review developments in their respective fields so that readers could learn what was-and wasn't-known about boron and its minerals, geochemistry and petrology. 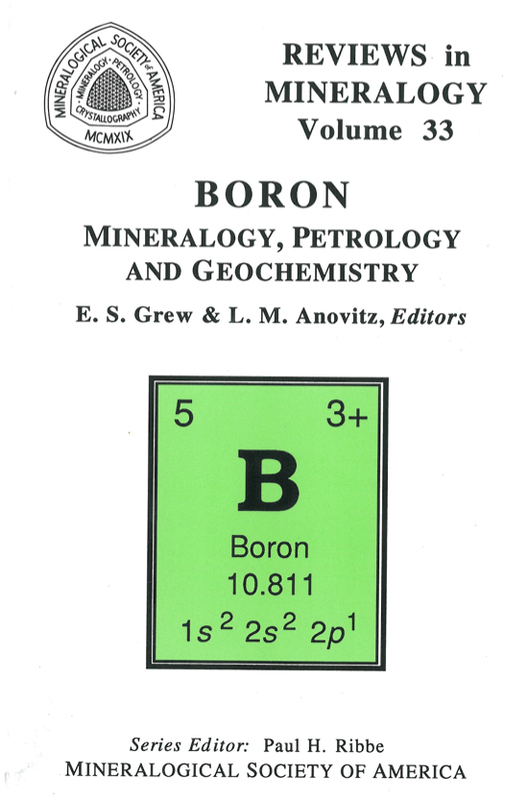 Since 1996, interest in boron has, if anything, increased, and continued demand for the Reviews in Mineralogy "boron bible" has motivated the Mineralogical Society of America to reprint the volume. Demand is reflected in citations, and according to ISI's Science Citation Index, the number of citations since publication to the volume is about 380, with some individual chapters having been cited as many as 44 times. In preparation for this printing, authors of 15 of the 19 original chapters have updated, corrected or added to their chapters within the constraints that no pages be added. Most addenda are bibliographies of literature published since 1996; a few also include summaries of significant findings. Addenda for each chapter follow the chapter, except for those for Chapters 1 and 2, which are merged onto pages 115-116 and 385. A table of new B-minerals since 1996 is given on p. 28, and many modifications were made to the table (p. 7-27) of B-minerals known prior to 1996 (corrections to formulae, mineral names, localities, etc.). Similar up-datings of Table 1 (p. 223) in Chapter 5 and numerous tables in Chapter 9 (p. 387) were undertaken, and Figure 15 in Chapter 11 (p. 619), which-embarrassingly-was missing from the first printing, has been supplied. Addenda to Chapter 13 are introduced on p. 744 and completed on p. 863 and 864. Tourmaline group. In addition to four new tourmaline species, a new classification has been proposed. Another tourmaline, olenite, has been shown to contain substantial amounts of excess B in tetrahedral coordination, a finding that has revolutionized our view of tourmaline crystal chemistry (Werding and Schreyer, Chapter 3; references in addendum to Henry and Dutrow, Chapter 10). Boron isotopes. New techniques for measuring isotope ratios using secondary ion mass spectroscopy (SIMS) with the ion microprobe open up new opportunities for in situ analyses of individual grains and fluid inclusions (Hervig, Chapter 16). Boron isotopes have found applications in paleoceanography and thus add to the tools available for the study of past climates (Palmer and Swihart, Chapter 13).